Independent author Alex Bunardzic recently published a book but has already developed a network and learned a lot about indie writing. Learn more about his work and his experience in this interview. My book is about certain difficult points in Buddhism. There appears to be a fairly large body of confusion about what is Buddhism, what is the fundamental Buddhist teaching and practice, and how can Buddhism fit into our daily lives. Upon closer inspection of the contemporary Buddhist literature available on the market today, it turns out that many of the books dealing with the topic are actually not discussing Buddhism at all. They’re mostly Brahmanism, Taoism, or other Absolutist religions disguised as Buddhism. My book discusses these issues and proposes to remedy this confusion. Hence the focus on the ‘difficult’ points. It is an attempt to clarify what Buddhism is and what Buddhism isn’t. In addition to that, my book also contains a straightforward set of instructions on how to follow the authentic Buddhist teaching and practice, without falling into the trap of Absolutist, Transcendentalist, or any other non-Buddhist practices. So my fundamental motivation for writing this book is to clarify the fog of confusion that is surrounding the Buddhist teaching and practice. 3. What sort of experience have you had trying to become traditionally published? I haven’t spent much time shopping for a traditional publisher, but I’ve got an inkling by talking to some friends who are published authors that these days traditional publishers are only interested in one merit — is the book going to be profitable (in their estimation). This lopsided meritocracy is not good for many authors who have a lot of valuable material to offer, while not necessarily striving for a best-seller position. 4. Overall, how do you like self-publishing? So far I’m loving it. It was dead easy to prepare the book for self-publishing, and the guided dialog I’ve had with the online book store site was quite delightful. Kudos to the designers of the KDP site! 5. What sort of marketing techniques have you used to sell your book, and which ones have been most successful? Once the book got published, I mentioned it to my Twitter followers and to my Facebook friends. In addition to that, I’ve alerted my friends and family via email. 6. Are there any marketing techniques you have intentionally avoided or discontinued, and if so, why? I’ve avoided traditional advertising techniques, simply because I don’t have the budget or the manpower to pursue that venue. I was not aware of the fact that, once I publish my book, even I as the sole author will be expected to pay for it in order to see how it appears in my e-reader! This didn’t make much sense to me, because I wrote and published the book in order to possibly make some money, not in order to be given a chance to spend some more money. 8. If you could do one thing differently in publishing your book, either online or in traditional media, what would it be? Before publishing your book, make an effort to join the so-called social media (Twitter, Facebook, etc. ), work on garnering some presence in there, and only then publish and announce your book. It will definitely drive some sales if you approach it that way. I’m presently working on a book that discusses modern approach to web development. It will be more of a technical, hands-on book (with some sample source code), but with strong a business slant. Light-hearted, fluffy and entertaining, but with a lot of bite. My writing stays with the readers, as they discover that they keep mulling over certain things I’ve exposed in my essays/books. They then usually call me back and want to discuss certain points in more depth. 12. How can readers learn more about your book? 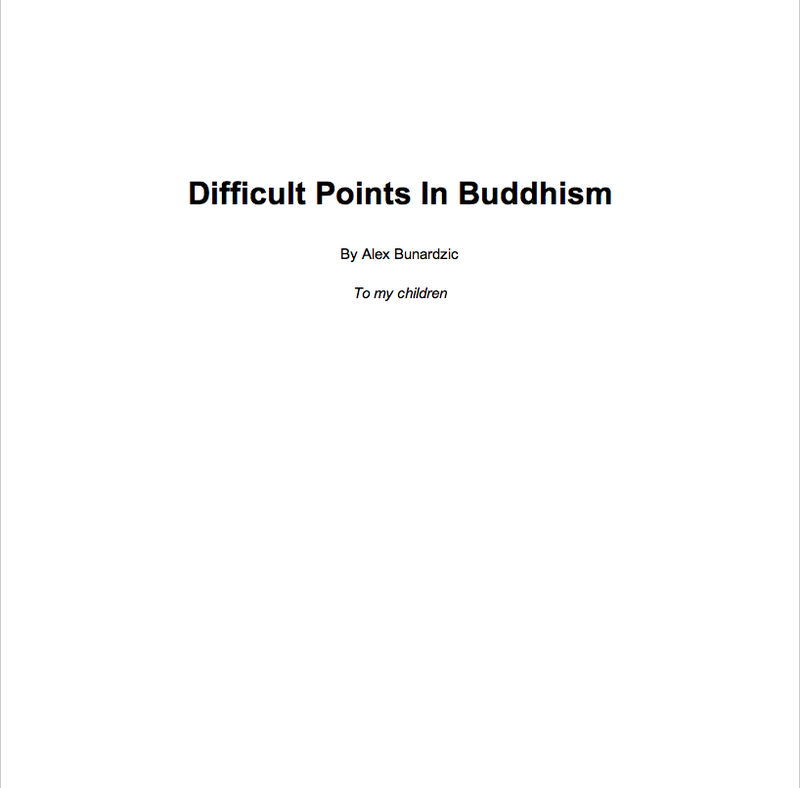 If they go to my book’s home page (http://www.amazon.com/Difficult-Points-In-Buddhism-ebook/dp/B0065R3P0Y), they should look to the right and spot the “Try it free” box. If they click on the “Send sample now” button, they will be able to order a sample of my book. If they read through the sample, it will give them enough information so that they could make up their mind whether to order the entire book or not.